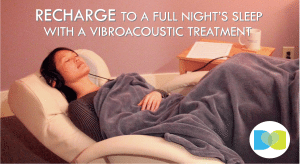 Vibroacoustic sessions are an opportunity for you to experience an emerging new form of overall health maintenance. Studies at the National Institute of health have shown Vibroacoustic sessions to be supremely safe and effective in reducing stress, anxiety, and fatigue. Vibroacoustic sessions are delivered in a specialized chair that delivers low-grade full-body vibrations, timed to pleasant relaxing music. The vibrations use very specific frequencies designed to calibrate with the different organs and areas of your body. They trigger the relaxation response in both body and mind and help restore you to optimal function. Vibroacoustic sessions require minimal effort from you, allowing you to be in a purely receptive mode. Schedule Today! in combination with your massage or acupuncture visit. Best for chronic tension and fatigue. The Harmonizer can assist in reducing tensions and disruptions throughout the body by helping the body restore its own optimal energy flow. Each three-minute segment, for a total of seven, takes the listener on a musical journey through the body, beginning at the base of the spine in the Key of C, then moving upward through abdomen, solar plexus, heart, throat, and brow, and ending at the crown in the Key of B. The Harmonizer facilitates the alignment of these seven bio-energetic regions into a synergistic whole. Best for stress or anxiety. Cho is designed to bring you to a place of peace and calm. The intent with this musical composition is the creation of a resonant field to attune you to the soothing vibration of the Cho Ku Rei (based on the tradition of Reiki healing). The composition uses a non-standard tuning system called the spiral of fifths tuned to C256, and employs principles and techniques from sacred geometry and the Schillinger System of musical composition arranged into a pleasing musical form. Best for Immune Support. Our immune system relies on lymphatic organs and vessels to protect the human body from bacteria/virus foreign substances and to clear infection from the body. It is important to keep this system strong so that bacteria/virus invaders can be dealt with effectively. The frequencies on this recording are programmed to assist in boosting your immune system functioning. Best for deep relaxation or sleep deficit. Maiden Voyage works with your brain to help you enter into a deeply relaxed state to put your everyday thoughts, anxieties and concerns behind you. Maiden Voyage uses Hemi-Sync, a patented, scientifically and clinically proven audio-guidance technology to provide sound patterns that guide the brain into a highly beneficial, slower-frequency state, akin to that achieved through meditation. Best for physical recovery and decreasing anxiety. After your physical body undergoes healing, energetic debris may remain in your emotional and etheric bodies. The frequencies embedded in this recording will assist in sweeping away the debris of traumatic history. The music used for Etheric Sweep is specifically composed with binaural beats to synchronize the brain hemispheres for increased relaxation. This selection has also been beneficial for decreasing anxiety and panic attacks. Best for prolonged stress. Difficult events and trauma can create prolonged stress as a result of ongoing stimuli or intense experiences that the mind has difficulty processing. Such stress can be the result of sights and sounds that remind us of hostile settings, or from direct physical injury. This recording offers music with specific frequencies/tones embedded within that are designed to assist in dissolving the effects of prolonged stress. We are, among other things, vibrational beings – the cells, tissues, and organs of our bodies all have their own vibrational rhythms. Vibroacoustics is an emerging field based on the fact that music and sound can be used to positively affect body function because our bodies attune to external vibration. Dreamclinic Tranquility Sessions are delivered using a vibroacoustic Somatron reclining chair with built-in speakers that are able to convert sound patterns into music and soothing vibrations that permeate the whole body. Dreamclinic is pleased to offer Tranquility sessions for our clients as a compliment to your massage or acupuncture sessions, or as an occasional stand-alone service to enhance your overall well-being. Form only works with Chrome and Safari.